Measure your old sink and use that measurement to choose your new one. Start by turning of the water supply to your sink. Then, turn on the faucet to relieve the pressure. WARNING: If you have a garbage disposal, turn off the power and disconnect it to make sure it doesn’t activate while you’re working. Remove the sink supply lines and position a bucket underneath to catch any dripping water. After that, disconnect the drain pipes and unscrew the discharge pipe. There should be clips that attach your sink to your counter top from underneath. Use a screwdriver to remove them. Then, use a utility knife to cut the caulk around the sink. From underneath, push the sink up gently and remove it from the cavity. Using a putty knife, scrape away any remaining caulk or grime. 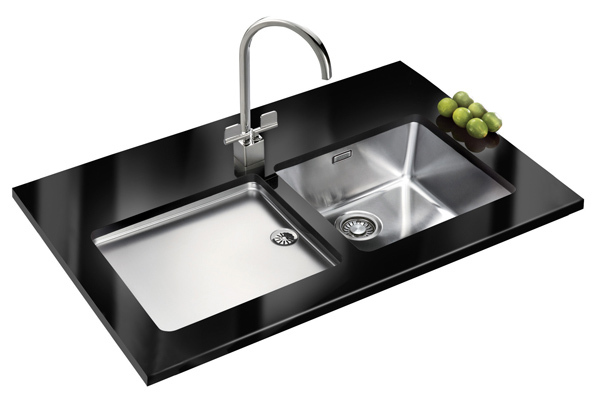 Once the area is prepped, drop your new sink into the cavity and make sure it fits. Remove it and set it on a flat surface. Place a bead of plumber’s putty around the drain strainer and attach it to the new sink, pressing firmly. Attach the new gaskets and flange to the underside of the strainer and tighten. Then, use your putty knife to clean away any excess putty. If you have a garbage disposal, install the new mounting bracket. After that, install the new faucet and the new clips to attach the sink to the counter top. Run a bead of silicone sealant along the underside of the sink’s edge and place the sink into the cavity. Press down firmly to seal the sink to the counter top, then use a screwdriver to tighten the clips underneath. Wipe away any excess sealant, then reattach the supply lines to the faucet. If you have a garbage disposal, attach it to the sink, reattach the discharge pipe, and plug it back in. Slowly turn on your water supply on and check for leaks.